By now you’ve heard about the left-wing Bernie Sanders supporter who attempted to kill Republican members of Congress this morning. As usual, the gun-grabbers took just minutes to litter social media outlets and Fake News networks with calls for gun control. 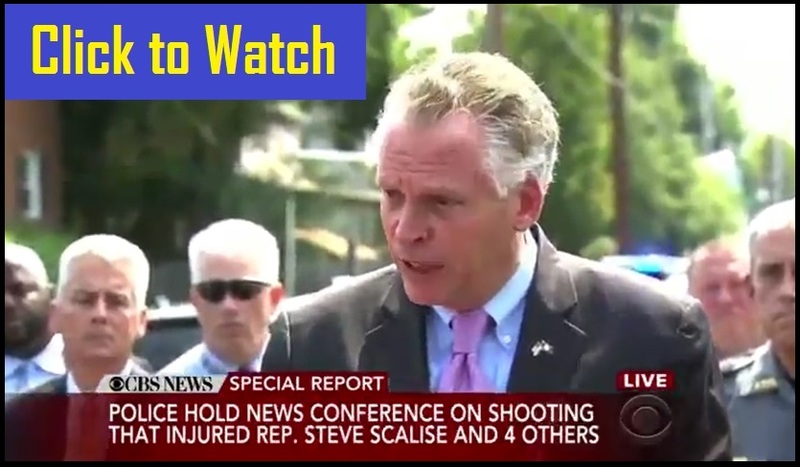 Standing just a few hundred feet from the crime scene, anti-gun Virginia Governor Terry McAuliffe strode to the microphone to spout anti-gun talking points (click here or below to watch the video). You see what the gun-grabbers are doing here, right? They’re trying to make this about gun control, and how they can shred our Second Amendment rights, not about the left-wing loon attacking Republican members of Congress. HELL NO! We won’t EVER give up our gun rights! In the coming weeks, it’s vital we make clear to our elected officials that we will strike back hard politically if any politician (especially Republicans) tries to ram through gun control. And as always, stay active, stay mobilized, stay involved, and NEVER back down. These people are brazen — always looking for any chance they can find to destroy our Second Amendment rights.